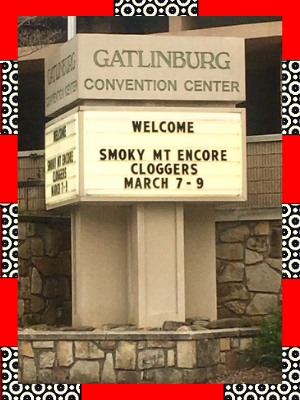 Smoky Mountain Encore workshop in Gatlinburg, TN is a favorite for Fancy Free Cloggers. Many non-dancing family members tag along to enjoy a mini vacation while we clog our feet off. 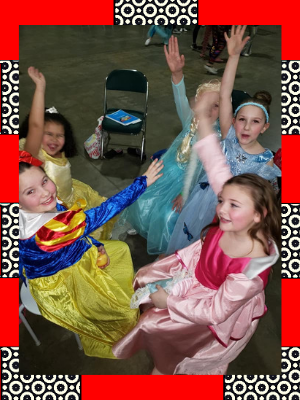 Our young dancers were particularly excited about this year’s Disney theme and the chance to dress up as princesses in the show. I ran into the famous Julia when picking up my registration materials Thursday night. This 91-year-old clogger is all over the internet after undergoing spine surgery and returning to the hospital to give her surgeon a dance lesson. Thanks for taking a minute to chat with me, Julia. I admire and respect you immensely. See you next year! The welcome sign looked the same as always, but Lynne’s letter in the syllabus warned us the workshop would be different this year; two regular instructors out of commission as they heal from surgeries (wishing speedy recoveries to Chip S and Morgan), and Jeff teaching with a boot on his right foot. Several new-to-Encore instructors made their debuts this year to fill the gaps. Lynne did not, however, warn us about the power outages! Windy weather brought at least 3 episodes of darkness, starting early Friday morning when I woke up cold and in my sleepy state couldn’t figure out why the heating pad wouldn’t turn on, and ending with a lengthy power failure Saturday night when my table finished dinner by cell phone light at Blaine’s. Word quickly spread that 2019 would be Dieter Brown’s final year as a regular Encore instructor. We made sure to attend his Friday morning class for a guaranteed fun teach. These ladies were tearing up the dance floor behind me during Dieter’s class. They made me smile every time we turned around. Remind me what team you are from, please. 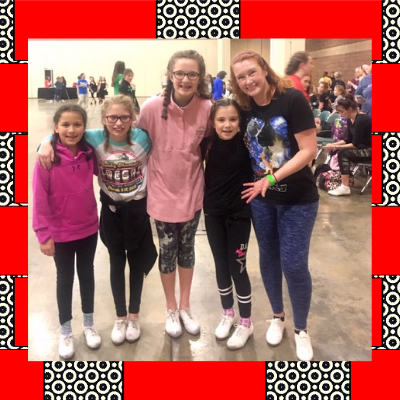 Here’s a glimpse at the future of clogging! These folks attended Loretta’s “Beginners from Scratch” classes, learning that a double toe step says “Tennessee” with your feet. 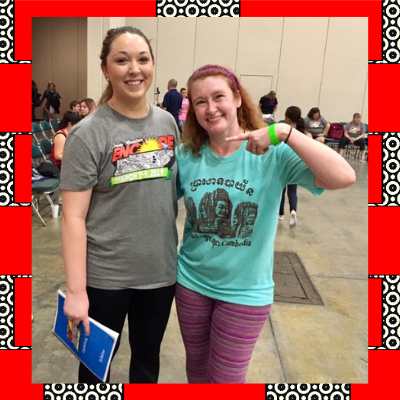 Two of Fancy Free’s newest cloggers, Haley and Myla, had a ball learning steps with Loretta. Haley declared double toes to be her favorite step (a solid choice since they’re in everything) while Myla liked the donkey step best. I present to you the smartest cloggers at Encore! 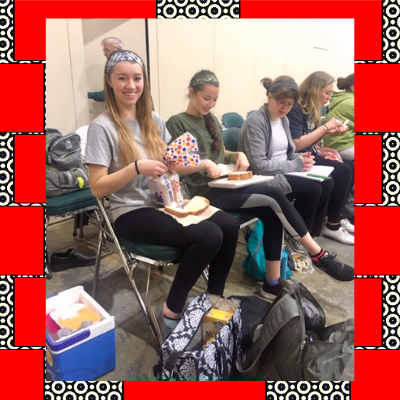 No need to choose between lunch and another dance class when you are prepared to make sandwiches between teaches. Well played, cloggers. I walked into Misty’s advanced class knowing it would be my humbling experience of the day; the cue sheet clearly stated hip hop was involved-not my comfort zone-and I learn advanced stuff at a slow pace under optimal conditions. This class started at 1:00, when the brain was full and the stomach empty. Let’s take a moment to give credit to these skilled cloggers who were still going at it when I headed across the street to Five Guys for lunch! The Friday night show was full of backstage photo ops! 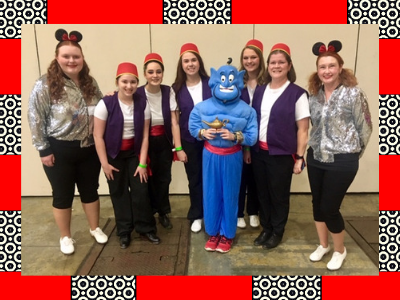 The Mo’ Town Cloggers (TN) looked great for their Aladdin number. Sole Impact (NC) showed off fabulous Alice in Wonderland costumes. This photo doesn’t reveal the best part of the rabbit outfit: furry legwarmers! 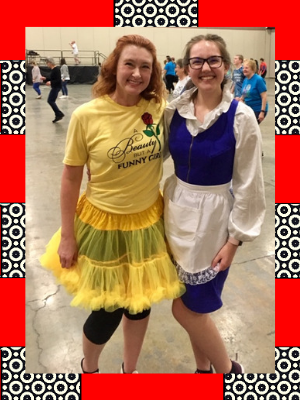 Fancy Free Cloggers had as much fun backstage as we did performing! 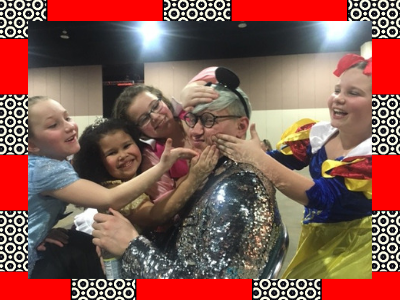 After “Uncle” Dustin (actual uncle to our Sleepy Beauty) helped the princesses with makeup, they shared suggestions to improve the look of his face! The adults received extensive training in a pattycake game: tic, tac, toe, gimme a high, gimme a low! Evie had a packed room for all four of her yoga classes, scheduled for the first and last time slots each day. 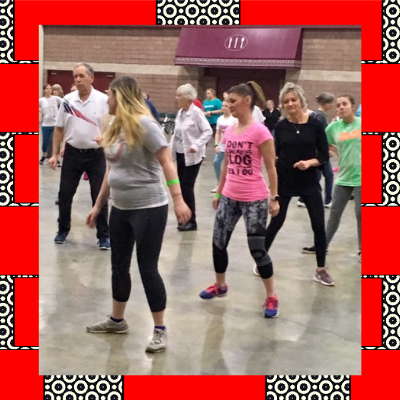 In addition to yoga, non-clogging options included contra dance, zumba, hip hop (Ken’s class is a favorite each year for one of my teammates), lifts, plus CCI training and CCA judge training. 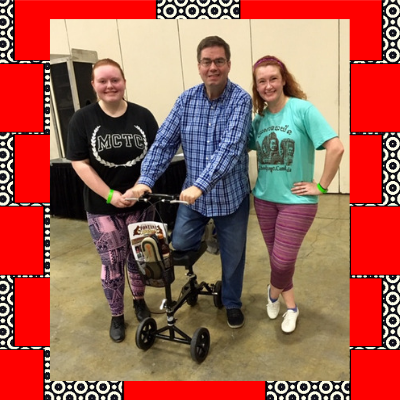 Jeff used a new mode of transport to get around the convention center, but a broken bone didn’t keep him from teaching classes! Jeff recruited help from his friends to demonstrate choreography (Thanks, Stephen! ), but still managed to perform steps with a boot. He hasn’t yet installed taps on the boot, but I wouldn’t put it past him. Jeff livened things up after teaching “Other Side” by offering a $20 prize to the dancer who could go the longest without making an error in this oddly-sequenced routine which begins with the second half of Part B. This Tennessee (I think) clogger! She beat out a floor full of contestants, myself included. Congrats! Trevor had a large class for his “One Shot” teach. Looks like everyone is got the steps just fine. Molly and I felt right at home in Shane’s “Never Comin’ Down” class. Bob, the beginner instructor for Fancy Free Cloggers, shares the same love of corny jokes. 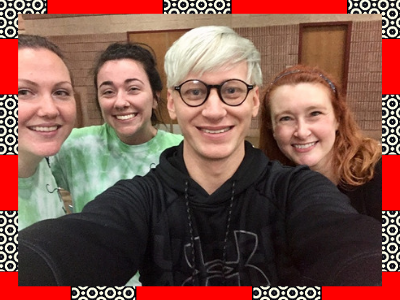 We chuckled and groaned our way through Shane’s teach and enjoyed every minute of it! The workshop tee shirts did not disappoint! 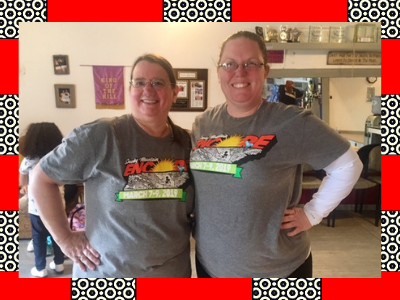 The comfy soft shirts, sold in both short and long sleeve versions, feature a clever design with the shape of Tennessee. We keep accidentally twinning at clogging practice. The fun dance on Saturday night lured more than one Belle to the ball. Go ahead and groan - I deserve it. Third place - A group of Mouseketeers. They did sing the Mickey Mouse Club song. Second place - A woman dressed as a character from Incredibles. She was clogging in seriously high heels! First place - Cruella De Vil. Her outfit was gorgeous. 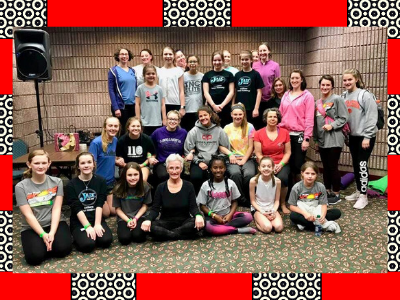 Overall, Smoky Mountain Encore remains one of my favorite clogging workshops. While some classes were more enjoyable than others, I took something away from every class session. The classes that were not my cup of tea probably rank as someone else’s shot of Tennessee moonshine! 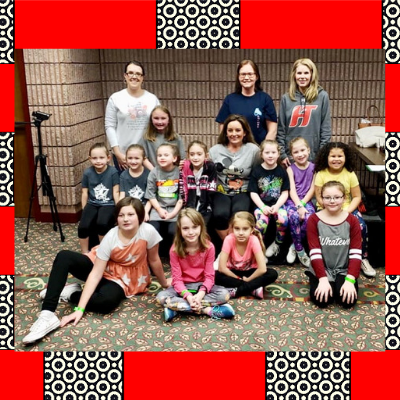 In addition to items already mentioned, major pros of this workshop include excellent sound quality, a stage in every room, a well-organized syllabus, plenty of bathroom facilities, and a convention center location within walking distance of many hotels and restaurants. Cons for me: Even with a stage, visibility of the instructors’ feet in the upstairs rooms is limited to the first couple rows of dancers. Over the years, I have learned to bear this in mind when choosing my schedule. Another con for me is the competition taking away one of the large teaching halls all day Saturday. However, I do understand that the competition is a big draw and they need space, too. Congrats to the new instructors of Encore(and to the dancer who completed CCI training! 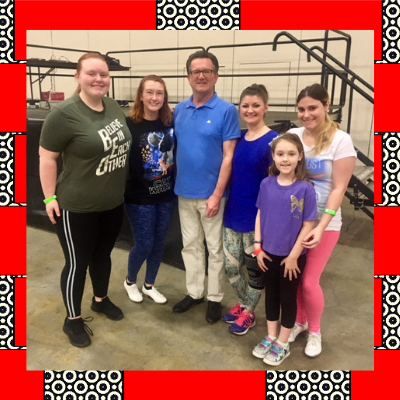 Thank you to the organizers, instructors, convention center staff, my fellow cloggers, and all the other folks working behind the scenes for a wonderful weekend of dance. MARK YOUR CALENDARS! 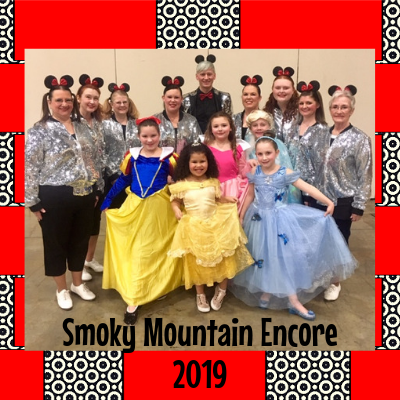 Smoky Mountain Encore 2020 is scheduled for March 12-14. Who’s already excited for Smoky Mountain Encore 2020? What workshops are YOU attending this year? Newer PostFor a day, I clogged with Kings! Older PostNew wallpaper and...a clogging stage? Homescapes game holds a fun surprise.